We understand bump stop selection can be confusing, but our collaboration with Fat Cat Motorsports has allowed us to put together unique bump stop kits that are sure to fill the needs of every Miata driver out there. So please read our extended description below and figure out which kit suits you best! This kit comprises of our Yellow (soft) density bump stops for front and rear to provide the softest ride for street driven vehicles. It is a factory balanced suspension bias which will provide soft bump damping to both front and rear shocks. 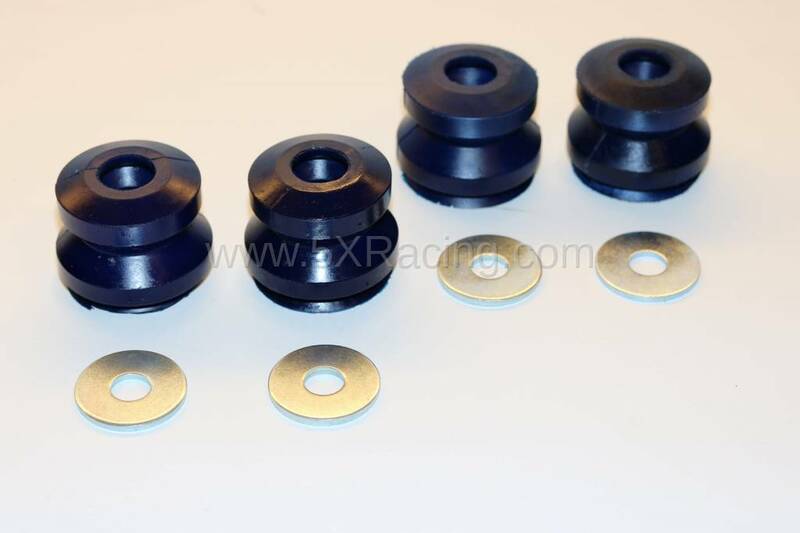 This kit is designed for cars which are lowered using conservative spring rates and desire a comfortable ride. This kit comprises of our Black (hard) bump stops for the front and our Yellow (soft) bump stops for the rear. This kit is a throwback to the legacy Fat Cat Motorsports "Sport" kit which consisted of stiff 36mm front and soft 46mm rear stops, but geared for cars with lower ride heights. This kit is designed to provide a "flickable" car with a bias towards front grip and an oversteer balance. A "Sport" feel would best describe this kit and is designed to produce a "well set-up" suspension feel. Drivers who frequent the auto-x course or drive "spirited" more often than not would appreciate this kit. This kit comprises of our Blue (medium) bump stops for both front and rear. This kit is a middle-ground between the Street Comfort Kit and Race/Track Kit. It is designed for those who want the factory balanced suspension bias which will provide medium bump damping to both front and rear shocks. This kit is a great "all-around" setup because it can do everything and is not biased towards one style or feel, therefore is a good choice for someone who has lowered their car using springs on the stiff side that doesn't desire a specific discipline or "feel". This kit comprises of our Black (hard) bump stops for the front and our Blue (medium) bump stops for the rear. This setup would be for primarily dual-purpose cars that drive to an auto-x or track event and back home. It is one step up from the Sport Kit in "flickable" feel, providing even more balance towards oversteer and helping to get the Miata turned-in quicker, which could help those in auto-x and on the track with a street tire. The dual-purpose nature of the setup will allow it to be composed and have a "planted" feel on the street, but without the worry of the car "stepping out" on you. 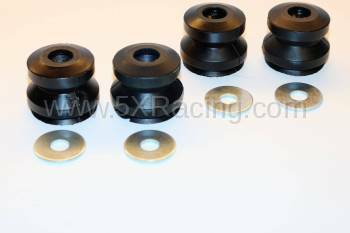 This kit comprises of our Black (hard) bump stops for both front and rear and is a throwback to the legacy Fat Cat Motorsports "Race" or "Track" Kits that used stiff 36mm bump stops on all four corners. This kit is the equivalent of what Spec Miata racecars use and is recommended for coilover setups using stiff springs (Spec Miatas use a 700F/375R spring rate setup). It is a factory suspension bias which will provide stiff bump damping to both front and rear shocks, however it should be used with a coilover setup where you adjust your own front/rear balance. This kit is designed for race cars and dedicated track cars, and will be overly stiff on a street driven car. This kit comprises of our Yellow (soft) bump stops for the front and our Black (hard) bump stops for the rear. This kit will provide a strong oversteer bias, with front roll-allowance and rear roll-resistance, effectively letting a car "step out" easier. This setup is designed for cars that are setup to drift, or for those who desire a very loose car on the track or auto-x course. It is not recommended for the street as it might cause the car to become unpredictable in the rain. This kit will provide a soft front feel and stiff rear feel, which will amplify the Miatas tendency to "jounce" through dips and yumps. One could tone this kit down a notch by creating their own kit of Blue 36mm bump stops for the front and Yellow 36mm bump stops for the rear individually HERE. Our custom moulded 36mm bump stops are the ideal choice and a great tool for fine tuning your suspension. Our 36mm bump stops are a specially designed multiple-use, progressive spring rate bump stop geared towards cars that have been lowered looking to recover lost shock travel. A collaboration between Fat Cat Motorsports and 5X Racing, these special bump stops were originally designed by FCM then brought to life by us. They are built to utilize only the lower portion of the taller 76mm Speedthane bump stops, capturing the "sweet spot" of that much longer progressive rate stop. Since the 76mm stop is too long for most suspensions, (especially lowered suspensions) this 36mm stop allows the same style of bump stop - just without the length - and is perfectly sized for your lowered, reduced shock travel setup. When you lower the suspension in your car, you lose shock travel due to the springs being shorter. This does not work well for stock length bump stops, as your shock will now have less distance between its body and the bump stop, causing a reduction in shock travel as the shock will bottom out on the bump stop even sooner than before lowering it. The easy solution to recover this lost shock travel is to use a shorter bump stop, and this is where our 36mm bump stops come in! Pushing that benefit even further, we offer three different densities to custom tune your ride characteristics. In the past, only one density of 36mm bump stop was offered - the stiffest density - so the name "Track Kit" was appropriate for racing and track use as the bump stop engagement was stiffer than most street users would prefer. 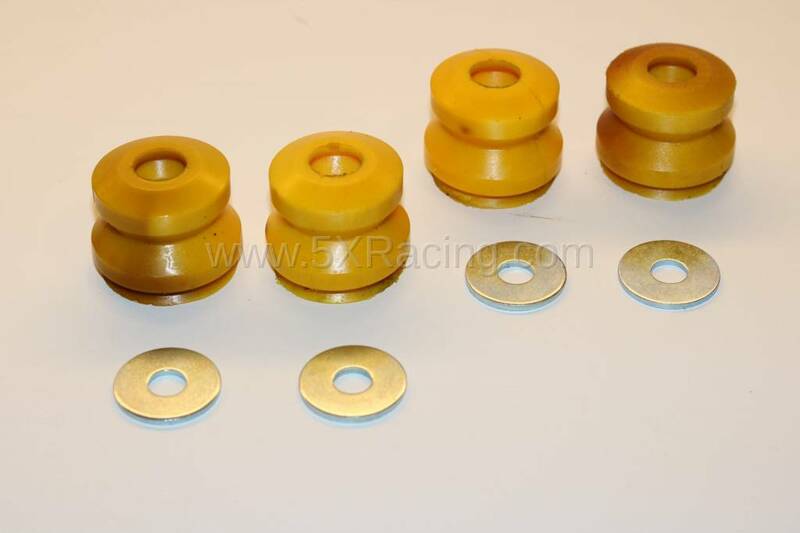 Using our 36mm bump stops, a driver can lower their suspension without sacrificing shock travel and customize their ride characteristics by using one of our pre-made kits consisting of combinations of our: 100 in/lb Yellow (soft) 36mm bump stops, 200 in/lb Blue (medium) 36mm bump stops, and 300 in/lb Black (hard) 36mm bump stops. Of course one can always create their own kit by purchasing our bump stops individually HERE. We realize bump stops are an education all in their own among the vast landscape of suspension technologies, so we strive to help educate you to the best of our knowledge with the help of Fat Cat Motorsports. There is a vast knowledgebase both on our website within our 5X Racing Technology and Information Center and online via forums and articles. Please feel free to contact us using our Inquiry Form and we'd be more than happy to assist you in answering your questions.